On November 7, President Trump woke up to a world in which Democrats had smashed through a gerrymandered map to win three dozen House seats, depriving him of both his legislative majority and his effective immunity from congressional oversight and accountability. He responded in the most Trumpian way: with an atavistic display of brute dominance. He insisted the election had been a triumph (“I thought it was a very close to complete victory”), belittled Republicans who had lost for declining his “embrace,” pulled the press pass from CNN reporter Jim Acosta, and warned Democrats not to investigate anything in his administration or he would refuse to work with them and have Senate Republicans investigate them back. And he fired Attorney General Jeff Sessions, whose sole offense, in Trump’s eyes, was recusing himself from the Russia investigation. Trump maintains the attorney general’s job is to protect [Trump's] the president’s political interests, even if [Trump] the president or his allies have committed serious crimes. Trump finally acted on this vision, skipping the normal chain of command and declaring Matthew Whitaker the acting attorney general. As recently as three years ago, Whitaker worked for a scam company that catered to customers with invention ideas and “provided almost no service in return,” according to the Federal Trade Commission. Whitaker’s role was to testify to the company’s integrity . . . . and serve as legal muscle, firing off threatening letters to customers who complained they had been bilked. Whitaker’s hostility to the Mueller investigation is surely what recommended him to [Trump] the president. He claimed Trump’s campaign had not colluded with Russia . . . . . at a time when such a defense could not possibly be known. He even denied that Russia interfered in the election at all, a conclusion directly at odds with what U.S. intelligence agencies have found. . . . Trump had appointed Whitaker as Sessions’s chief of staff, a position that reportedly allowed him to serve as the president’s eyes and ears within the building. Whitaker will have ample opportunity to undermine or quash Mueller’s investigation, but his authority over Mueller is not the only weapon at Whitaker’s disposal. Nor is the Mueller investigation the only threat to the president. Trump is a crook who is drawn to other crooks, and the potential criminal exposure across his administration is vast. We barely have a handle on the criminality that has already occurred — it has only been in the last few weeks that we learned, via the Times, that Trump committed systematic tax fraud over many decades. A lawsuit credibly accusing Trump of having run a variety of “fraudulent schemes” came out October 29 — nearly two years after his election. [I]t is difficult to estimate how much misconduct has escaped detection. Weeks before the election, congressional Republicans privately circulated a lengthy list of Trump scandals that would be investigated if Democrats won Congress. The list ranges from Trump’s tax returns (which Republicans had voted to keep hidden) to his acceptance of undisclosed payments from foreign and domestic interests while in office to more routine incompetence and sleaze, like lavish expenses by Cabinet members and the hurricane response in Puerto Rico. In public, Republicans are warning that investigating any of these matters will backfire on Democrats. . . . . Yes, sometimes aggressive congressional oversight can backfire, like when Republicans fanatically pursued conspiracy theories like Benghazi and “IRS targeting” during the Obama years. . . . . Even if Congress somehow overreaches in its pursuit of Trump — a prospect that is almost logistically impossible, given the staggering list of misconduct already in plain sight — it would still probably help the Democrats’s 2020 presidential candidate run against the mess in Washington. 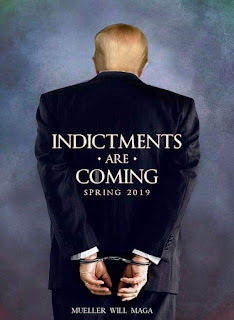 From the very beginning, when Donald Trump and his father ignored demands from the Nixon Justice Department that they stop discriminating against African-Americans, through his repeated tax fraud and financial scams, legal impunity has formed the through-line of his career. Holding him accountable serves not only Democrats’ self-interest but the rule of law. That process begins now.